If you’re tired of the bugs and a little too much nature while you’re out on your patio, then maybe it’s time to screen things in. 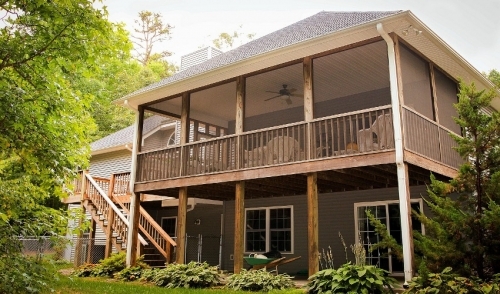 Luckily, if your patio as an overhang attached to the house, then much of the framing is already done for you. The rest is as simple as attaching a top and bottom plate between the support posts, and wall studs from floor to ceiling between the same posts. There are a few different methods in which screens can be installed. The old-fashioned way was to simply staple screening along the rails and studs, tightening as you go. You would then finish it off by tapping in some trim over top of the staples. This usually is the easiest and least expensive method, but over time the screen material can sag and stretch. Screen repair is somewhat more involved and may require some disassembly and lots of staple removal. A modern choice that has become very popular for installing screens is the spline screening system. A spline system uses strips of track (usually vinyl or metal) that are fastened to the porch framing. The tracks have grooves that, when used along with vinyl splines (a cord-like material) will hold the screening material in place. To install the spline into the groove, you will need a roller knife. The roller knife is basically a smaller version of a pizza cutter, except the edge of the wheel has a groove to accommodate the spline rather than a cutting edge. When used, the screen is held over the groove on the track. Next, the spline is laid over top and then pushed into the track with the roller knife. This securely holds the screen in place and adds a little extra tightening as the spline pushes into the groove. This method makes tightening or repairing screens much easier, since it just involves pulling the spline out replacing or adjusting the material and reinstalling the spline. Another option for screening in your patio would involve the use of removable screens. This modular approach would involve a more elaborate framing system around the patio with more precise measurement, but the end result would be secure, attractive and easy to maintain or repair. In fact, it’s possible to make your own frames, though accurate measurement is very important. Like the spline system mentioned above, use of track and spline can be utilized here to great effect. For a detailed, step-by-step instruction on how to build a screened in patio from the ground up, Family Handyman has a very helpful article here. When you think you’re ready to tackle the job, stop in and see us for the materials, tools and advice you need to get it done right.